To better serve clients, Tekmap Consulting continually develops and updates its GIS tools and applications. This includes contributing to core GRASS and MB-System programs and developing custom programs and GUIs for GRASS, MB-System, and data processing. 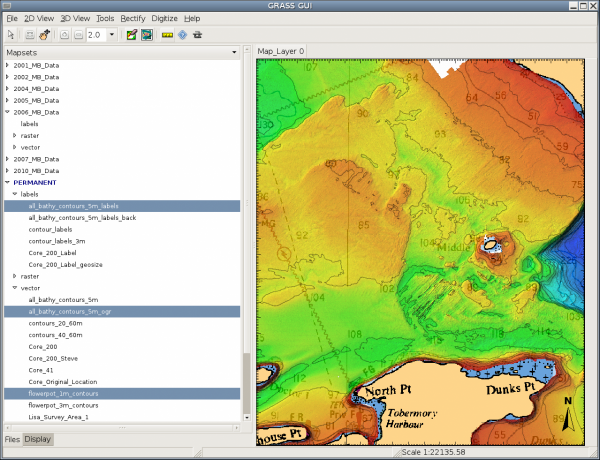 Tekmap develops several custom GIS Tools using the GTK+ programming language. GTK+ is “a multi-platform toolkit for creating graphical user interfaces”, with ports to Linux, WIN32, Mac OS X, and Direct FB. Tekmap also develops programs in C for GRASS and MB-System. The Sidescan viewer SonarWave is written in C#. Tekmap has moved the software development web pages to a blog format. This is to accommodate the active development and frequent updates associated with the software. Check out Tekmap's download page for quick access to software available at this site. The SonarWave Lite software, a free program developed by Tekmap Consulting, is an innovative tool designed for viewing Extended Triton Format (XTF) file. You can view XTF sidescan files with low or high frequency channels and also sub-bottom profiles. The GTK+ GRASS Interface 3D View lets the user save a keyframe animation directly to a supported animation format. The 3D view uses the GRASS ogsf library to render an animation. If the GRASS ogsf library has been built with the optional FFMPEG library, movies can be directly rendered to any supported format. 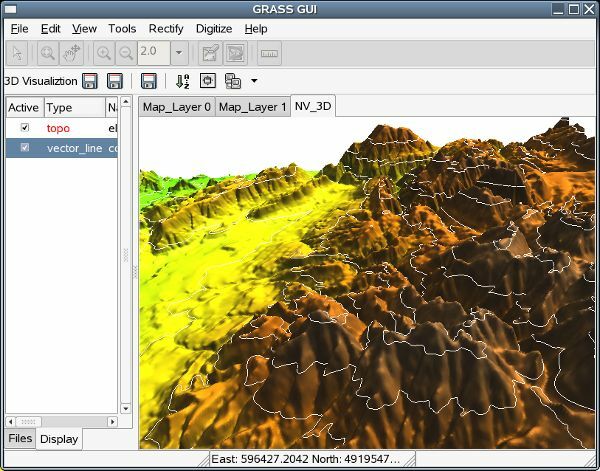 The GTK+ GRASS Interface can be built with an optional port to the GRASS ogsf library providing 3-D visualization support. This requires the user to install GtkGLExt, an OpenGL extension to GTK+ 2.0. The size (width) of the profile (cross-section) can now be set with a map scale size. The existing Size (pixels ) is still available. Plot files can be saved to a single image or a series of PNG tiles. The single PNG image is saved at the same size as the display canvas. The PNG tiles are saved by breaking the plot into a user-defined series of tiles. The right pane of the GTK+ GRASS GUI displays several user controlled Map Layers. The map layers can be added or removed at any time. Each map layer (tab) has its own associated GRASS Region, and display list (previous post). 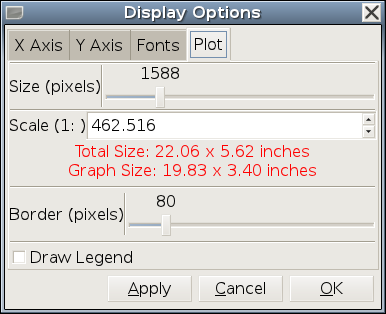 To optimize drawing speed, the GTK+ GRASS GUI uses its own internal drawing routines for GRASS files and decorations. Display options include the usual interactive zoom window, zoom/out, pan, erase, redraw, measure, and query. The GRASS region can also be manually edited at any time.